Processing paper time sheets can be a very labor intensive task, but is a necessity for many organizations. Simplify your time sheet process by setting up a paper form that can be automatically tabulated by Remark Office OMR. Whether you need to track your employees or contractors hours daily or weekly, you can set up a scannable form that can be read by Remark Office OMR. You can create your time sheet form in Word, Excel or other word processing applications according to our form design best practices. Once you have completed your draft of your form, feel free to send it in to our support team for a free form review. 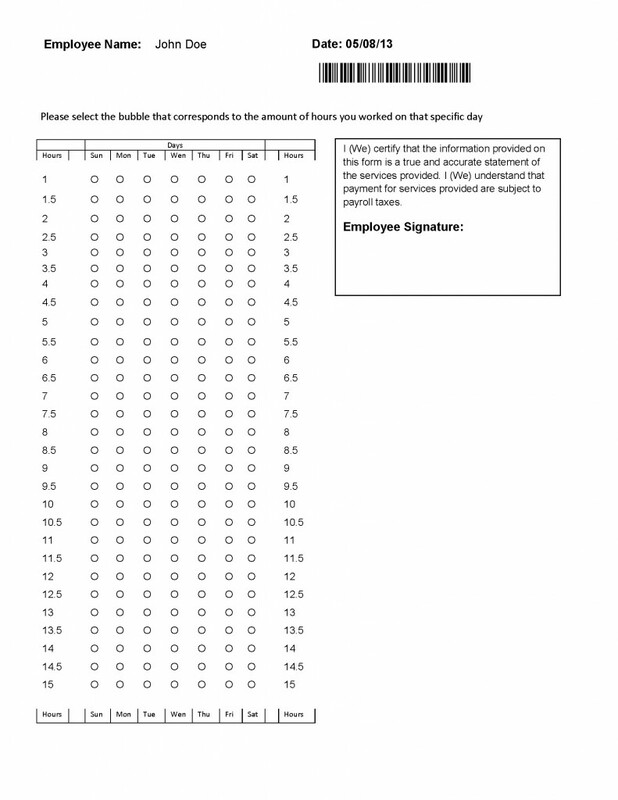 Once your form is ready to go, you can print them on regular paper to distribute to your employees and contractors. Collect the completed forms and scan them using any image scanner, multifunction printer or imaging device (e.g. phone with scanning app) into Remark Office OMR. Remark Office OMR will tabulate the hours submitted on your time sheets and allow you to review the scanned data on screen. You can easily export your timesheet data to Excel, Access, CSV, SQL and a variety of other file types for easy importing into your payroll system. A machine printed employee name which can be added in Microsoft Word using the mail merge feature. This area will be read using the OCR (optical character recognition) feature in Remark Office OMR that reads machine printed text. The date is another example of an area that can be added with a mail merge and processed using OCR. The barcode is a code 3 of 9 barcode, which installs in your Windows font directory when you install Remark Office OMR or you can manually download it here. This value could be a specific project, location or other data you wish to have on your timesheets. If it is a variable option based on the employee you can set it up in a mail merge as well, or if it is a static value you can just enter it while creating your form. The bubble-in area for the hours reporting is set up using a scale of half hour increments, organized by day. The employee will enter the total amount of hours worked each day. Remark Office OMR can output the hours worked each day and also the total hours worked in a week (using an Add field where it tabulates the values across the days entered). These bubble-in areas are processed using the OMR (optical mark recognition) engine in Remark Office OMR. The employee signature area can be captured as an image clip to show employee sign off on their time sheet. Remark Office OMR will capture a snapshot of a defined area and will output those images in the comment reports built into Remark Quick Stats, the software’s built-in analysis and reporting engine. If you are interested in using a similar time sheet to the example above, you can use our sample form and edit the Word document as needed. You can also create your own forms in Google Docs, Word, or Excel. When creating your own forms please make sure to follow our form design best practices and take advantage of our free form review service.